Yoga — Just Dru It With Diane! 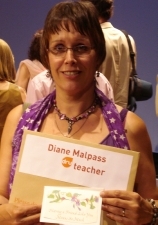 Diane currently holds yoga classes on Tuesday evenings, between 7.30 - 9.00pm, at Essington Wood Methodist Church Hall, Bursnip Road, Essington WV11 2RE. The cost is £7.00 per class or a pre-paid block of 5 classes taken within a 7 week period for just £30.00. The classes follow the Dru Yoga format. Dru Yoga is one of the largest yoga schools in the country and indeed one of the largest yoga organisations in the world. It has its foundations set firmly in ancient yogic tradition, working on body, mind and spirit, like many other styles of yoga. It is a graceful and potent form of yoga, based on soft flowing movements, directed breathing and visualisation. It may help by improving strength and flexibility, creating core stability, building a heightened feeling of positivity, and deeply relaxing and rejuvenating your whole being. It is an ideal way to de-stress the mind and the body. Your Dru Yoga class will work with the practice of Activations, whereby the body is taken through a sequence that warms and prepares it. Followed by asanas (postures) done in unique flowing sequences, called Energy Block Release (EBR) sequences (a little like Tai Chi), aiming to free energy blocks within the body that may be there due to physical or emotional traumas received by the body. Then perhaps a few more asanas, or a sequence. Sometimes some Pranayama breathing. Mudras (hand gestures, used to focus or direct power within the movements) are also used during some of the classes, as are affirmation. We always finish the class with a deep relaxation. What to bring with you to your class? — If possible a mat (don’t worry if you don’t have your own to start with as I always take along spares ‘just in case’); a blanket and cushion, for relaxation; a bottle of water to keep you hydrated during the class; but most of all enthusiasm and a SMILE! The current class members are a really friendly bunch and welcome the addition of new students. If possible please try and arrive a little earlier to your first class to allow time to complete a short enrolment form. I hope you will consider coming along to try out one of my classes. If you require further information please do not hesitate to contact me.